If you have any questions or want to enquire about dates, use our form to contact Fiona Lappin or see their website for more information. Surrounded by stone walls, sheep and Howgill Fells… in the glorious Yorkshire Dales National Park. Well-travelled Fiona and Graham have restored the barn next to their farmhouse into deeply comfortable, smart spaces. Graham was born in India and tea plays a big part here! Arrive to a mound of scones, meringues, triple choc brownies. Sitting and dining rooms are upstairs: high rafters, Indian art, colourful elephant side tables. Tuck into breakfast at the big communal table: wild boar bacon, venison sausages, veggy choices, homemade bread; lively dinners too. Sedburgh is a hop; return to a sunny terrace, toasty wood-burners, a wonderfully luxurious bed. Afternoon tea included. Soup & charcuterie supper, £17.50 (Mon-Thurs). Friday feast, 3 courses, £30. Last Thursday of month dinner, £30. Pubs/restaurants 2 miles. Our second visit to The Malabar, and it did not disappoint. This lovely barn conversion is tucked away in the countryside with easy access to the Yorkshire Dales, Howgills & Lake District and only 2 miles or so from the M6. The room with wonderful ensuite was spacious and very comfortable. Afternoon Tea & breakfast were delicious and we particularly enjoyed the bedtime treat of local fudge! The owners we incredibly helpful and accommodating, including sorting out reservations for local restaurants! I can only recommend that you go and stay, as we didn't want to leave. Lovely, welcoming, peaceful place to stay, converted barn that has wonderful window views over the surrounding hills with welcoming and kind hosts. Thoughtful touches abound, it was hard to leave! We stayed for two nights on our way back from Scotland to the south coast. Afternoon tea on arrival and our breakfasts were delicious with an amazing range of teas. Our room had great views and a luxurious bathroom. A pot of tea was delivered to our room each morning. Most of all Fiona and Graham were charming hosts - they recommended and booked places for evening meals and couldn't have been more helpful. We very much hope to stay with them again sometime. We were one of the first guests to stay at The Malabar and we were very lucky to do so as this place definitely won't stay quiet for long! Graham and Fiona were delightful hosts - not too hands on, which we liked, but warm, genuine and friendly when they were around. We were in the Earlston suite on the first floor, which was huge. The barn doors separating the bathroom were an impressive feature and the bathroom itself was the ultimate in luxury... toasty underfloor heating with deep freestanding bath, huge rainfall shower and luscious Bath House toiletries. We can't wait for our next visit! What a lovely welcome in a beautiful location. Fiona and Graham are very hospitable. We enjoyed a marvellous afternoon tea on arrival. The room was beautifully furnished with a splendid view of the Howgill Fells. The listed barn has been sympathetically converted with lovely original features still visible. The bathrooms are a delight and the beds very comfy. The breakfasts were generous and were sourced from local food producers. The location is perfect for walking, cycling and to just soak in the beautiful countryside. We shall definitely visit The Malabar again. 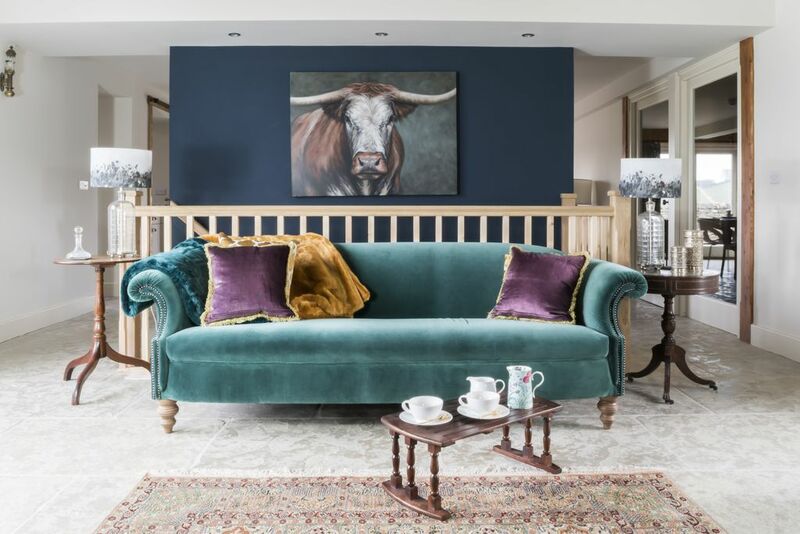 The Malabar is perfectly placed on the edge of the Yorkshire Dales National Park, 2 miles from the town of Sedbergh and 20 minutes from the Lake District. Its the perfect base - away from the crowds but within easy reach of all the area has to offer. Sedbergh is an elegant market town and there is plenty to see and do both indoors and out. As well as being surrounded by spectacular countryside, Sedbergh is England's Booktown and home to the popular Sheepfest celebrating its once thriving wool industry. The Dales Way footpath runs along the River Lune at the bottom of our field. Stroll through meadows, enjoy the magnificent Lune Viaduct with uninterrupted views of the glorious Howgill Fells, where you can walk all day without seeing a single soul. With cycle trails that rival the best the Lakes has to offer, enjoy some of Britain's best mountain biking from our doorstep. Road cyclists can attempt the challenging Stage 2 of the Tour de France in Hawes 12 miles away. Farmers markets are a regular feature in the area showcasing exceptional foods including rare breed meat and world-renowned cheeses. Some of the best local producers feature on our breakfast menu alongside fresh farm eggs. Cumbria is renowned for its food and drink and there are plenty of places to eat from award winning pubs to some of the best restaurants in the country, all celebrating outstanding local produce.